removal, skin rejuvenation, wrinkle removal, skin tightening, pigment therapy, vascular therapy, breast liftup assistant, tattoo removal. 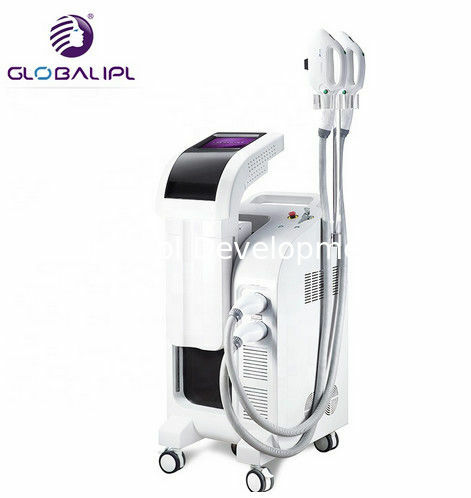 YAG laser makes use of the instantaneous emitted laser to break the pigment in ill structure. That's the laser instantaneous emit theory: centralized high energy emit suddenly, which makes laser of settled waveband instantaneously penetrate through cuticle to the ill structure in 6ns, and break the relevant pigments quickly. IPL/ E-light works by gradually heating the dermis to a temperature that effectively damages the hair folliles and prevents re-growth, while avoiding injury to the surrounding tissue. The RF energy introduce fractional thermal into the deep dermis and create potential healing effects in the microscopic thermal zones. 1. Choose us, you needn't worry about the ability of supplier. 2. Choose us, you needn't worry about the quality of products. 3. Choose us, you will get the feel service as family. 4. Choose us ,you needn't worry about the packing and shipping problems. We tacitly approve DHL, if you want choose other types of shipping,we can offer. Our on-time delivery rate reaches 100%. Use air box to pack the machines which can be delivered to you in good condition.